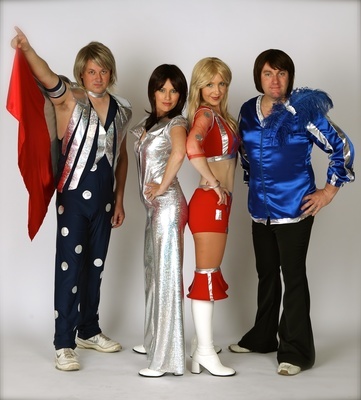 GIMME ABBA: Tribute act Bjorn To Be Wild comes to Club Italia on Saturday. ABBA fans, including a woman who tattooed cover bands on her arm, make every night playing in tribute act fun for Mt Duneed’s Sam Cocking. “They know all the words and most of the time they’re up dancing for the first song,” the mother-of-two told the Indy. One super fan had tattooed their name, Bjorn To Be Wild, alongside several other cover bands and brought multiple ABBA costumes to each show, Cocking said. The long-time singer, who grew up in Highton, started the all-Geelong cover band with high school bestie Angie Hilton. With acts like Bjorn Again and BABBA touring internationally, an agent suggested they could fill a local gap in the market, Cocking said. With two daughters to raise, music had become Cocking’s “side hustle” rather than the “bread and butter” work it once was, she said. She grew up in a musical family and worked as a singer on a cruise shop following a long European holiday almost two decades ago. “I come from a long line of singers in my family – so it was kind of unavoidable,” she said. Cocking’s daughters were showing some of their mother’s musical talent, she said. Cocking looked forward to Born To Be Wild’s first gig ever at Club Italia on Saturday, followed by a show at Mt Moriac later this month. “It’s lovely to be able to do some local things as well,” she said. “We’ve been singing together since high school. “We don’t take ourselves too seriously – we’re a bit tongue in cheek. We put on silly accents, costumes and sing the music but it’s all a bit of fun. Hilton will miss Saturday night’s gig for another commitment but former Bjorn Again singer and experienced ABBA tribute artist Julie Walter will take her place.